As you create your budget, you’ll be taking note of all your expenses. This is the perfect time to remove items that are costing you too much money and you don’t really need. 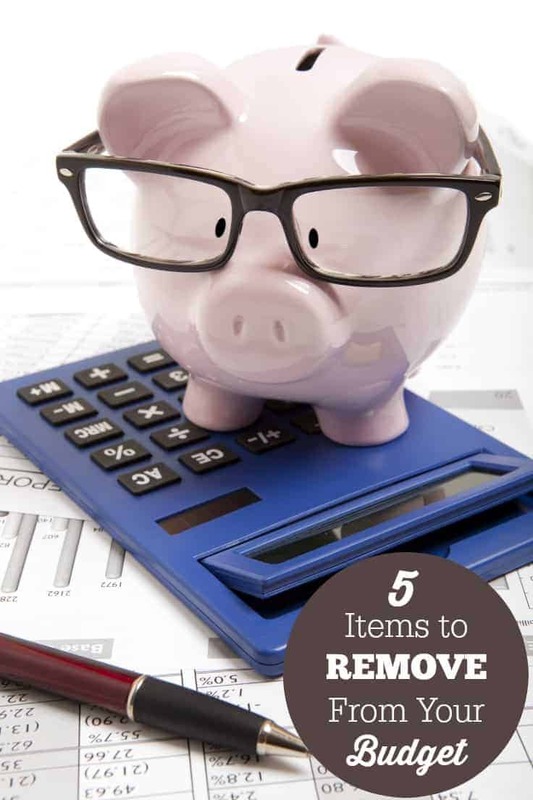 While everyone will have different items on their list, these five items to remove from your budget are pretty common expenses that can be removed without missing them too much. If you’re spending money on them, consider how much money you would save if you stopped. Every penny adds up! 1. Cable. With Netflix and other streaming services, there is really no need to be paying $80 a month for cable TV. Instead, pay a small monthly fee or a one-time fee and stream your favorite TV shows. I personally have Netflix and have survived life without cable for over 5 years. 2. Takeout Coffee. I know. You think you need it. Trust me when I say that you don’t and neither does your budget. Cutting it out can save you hundreds per month depending on what you’re currently paying. Instead, pick up a coffee maker for a one-time cost and make your coffee at home. I stopped making my morning run to Tim Horton’s last year and am still able to drink delicious coffee! 3. High Insurance Payments. Are you paying too much for car or house insurance? It doesn’t cost anything to call to for a quote. Then you’ll know if what your paying now is a good deal or if you can do better somewhere else. 4. Home phone. If you still have a home phone, drop it unless you need it for your Internet connection. Your cell will work just as well. Most people I know don’t even have a phone and rely solely on their cell phones. 5. Magazine Subscriptions. You know those magazines that clutter the kitchen table? They’re costing you money and they usually just end up as clutter. Instead of paying for all of them, weed them down to one or two that you really like and drop the rest. It isn’t much money per year, but you’ll enjoy the money you’re saving. As an alternative, consider signing up for Next Issue. You can read all your favourite magazines on your tablet and there’s no clutter to deal with. While these items aren’t the only ones you’ll want to consider removing, they’re an awesome place to start. As you live within your budget for a few months, you’ll notice more and more that you can remove without too much “pain” being inflicted. What items would you consider removing from your budget? I would consider removing soda pop from my budget at home and when we go out! Thanks! Agree with all of these! Also switching to a low cost cell phone carrier (such as Republic Wireless or Cricket). We’ve loved cutting cable – save so much money and don’t miss it a bit! We didn’t cut cable out completely but went down to basic. We have cut out coffee out and magazines. I want to cut the cost on cable but my husband says it’s the same price as your internet. haha! So that’s out. We have a landlines but we both have pay as you go cell phone! It’s a lot cheaper then monthly plan. I haven’t subscribe to Magazines in years. Be careful when you cut out or down on the insurance; not all companies, policies or coverages are equal. I had a family member find out the hard way during the 2013 Flood in Southern Alberta that the deal they acquired through an online/phone quote was sub-par compared to what they previously had. They were out almost $65K when all was said and done. I personally don’t understand why anyone still subscribes to any magazine service when the information is pretty much free online. I’ve removed my magazine subscriptions & take out coffee. Would like to remove cable, but finding it hard to take that step! We’ve never had cable. I don’t drink coffee. My husband is vigilant about staying on top of our insurance situation. And we have zero magazine subscriptions. I guess we’re naturally cheap. One thing I would point out is that where I live foster parents are required to have a working land line, so the suggestion of dropping the home phone won’t be practical for those families.